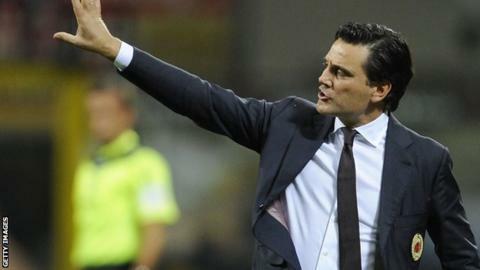 Sevilla have agreed a deal with Vincenzo Montella that will see the former AC Milan boss become their new manager. The Spanish club have been looking for a new coach since they fired Eduardo Berizzo on 22 December, a week after he returned from cancer surgery. They are fifth in the La Liga table. Montella, 43, has been without a club since Milan sacked him in November. Sevilla said the Italian would on Friday sign a contract until June 2019. Berizzo, 48, was fired after a 0-0 draw with Levante on 15 December, having undergone a successful prostate operation in November. His condition was made public after Sevilla came from three goals down to draw 3-3 with Liverpool in the Champions League group stage on 21 November. Sevilla's next match is away to Cadiz in the Copa del Rey on 3 January, before a home La Liga fixture with city rivals Real Betis on 6 January. They have won just once in their previous five games, trail league leaders Barcelona by 16 points and are two points behind Real Madrid in fourth.